As a founding member, Canada has played a significant role in the evolution of NATO since its inception in April 1949. Canada particular made significant contributions in the drafting of Articles 4 and 5 as well as influencing the outcome of Article 2, which is known as the “Canadian Article”. Article 2 encourages allies to develop politically, socially and economically. Article 2, outlines the importance of strengthening free institutions and encouraging collaboration between allies. Cooperation and membership in NATO has been a cornerstone of foreign policy and relations with Europe. 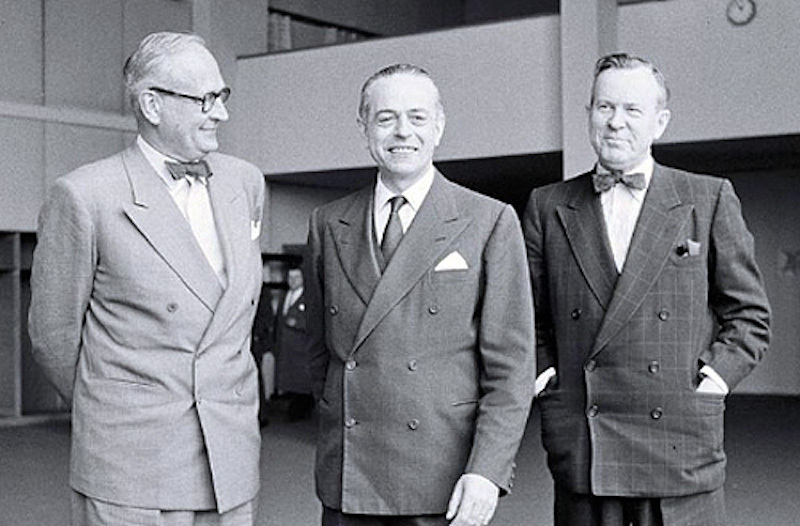 Former Canadian Prime Minister Louis S. St-Laurent and former Foreign Minister Lester B. Pearson maintained that the treaty “served as a beacon of hope for those who were vulnerable and threatened”. Broadening the strategic framework to include non-military cooperation and regular political dialogue was considered a “major step forward” in developing greater unity in the Alliance. The report also secured NATO’s political role and permanently branded the Alliance as a military and political organization. The Committee of Three came to agree that the aims of NATO had changed and that civil and military security should work in tandem. As a result of the report, the impact within NATO was significant. NATO’s Science for Peace Programme was subsequently launched. The NATO Science for Peace and Security (SPS) Programme brings scientists and experts from NATO and partner countries in the areas of “security-related civil science, technology and capacity-building”. Another result was the establishment of national information officers, the Committee of Political Advisers and the Committee of Economic Advisers. The very same year as the launch of the report, Paul-Henri Spaak, an advocate of non-military cooperation, became Secretary General of NATO . In addition to the development and commitment to the political arm of NATO, Canada has also significantly contributed to NATO’s military structure. Overall, Canada and Canadians have demonstrated their commitment from being key drafters of the NATO Treaty to participating in every NATO operation to date. Operation ANCHOR GUARD: Conducted from August 1990 to February 1991. This operation was the subsequent response to the Iraqi invasion to Kuwait. The NATO mandate was protect Turkish airspace. Canadian Contributions: “Sixty-six members of the Canadian Forces participated in the operation, 64 of them having served during the period of hostilities”. Operation Allied Goodwill I & II: 4-9 February & 27 February – 24 March 1992 Conducted from February 1992 to 24 March 1992. NATO Operation to provide international relief following the break-up of the Soviet Union. Canadian Contributions: Also known as Operation Boreal, Canada’s contributions included Two Canadian Armed Forces (CAF) CC-137 Boeing flights delivering aid. Operation MARITIME MONITOR: Conducted from July 1992 to November 1992. This operation was the enforcement of embargos on all products from or destined for the Federal Republic of Yugoslavia (Serbia and Montenegro), with the exception of medical supplies and food. Canadian Contributions: Canada sent MPA – CP 140 Aurora to the Mediterranean. Operation PALLADIUM: Conducted from December 1995 to December 2004. This operation was Canada’s contribution to NATO’s Mission in Bosnia-Herzegovina. Canadian Contributions: 1,700 Canadian military and civilian personnel, and 300 local employees. Operation ECHO: Conducted from June 1998 to December 21 2000. Canada’s contributions to enforce a no fly zone in the Balkan region in support of the NATO Stabilization Force (SFOR) and Kosovo Force (KFOR). Canadian Contributions: six CF-188 Hornets and 130 personnel. Operation KINETIC: Conducted from June 1999 to June 2000. CAF’s contributions to KFOR, the NATO peacekeeping force that operated in Kosovo and the Former Yugoslav Republic of Macedonia. Canadian Contributions: 1,400 CAF personnel. Operation FORAGE: Conducted from August 2001 to September 2002. The Canadian Armed Forces contributed to NATO operation Essential Harvest in the former Yugoslavia republic of Macedonia. Operation ATHENA: Conducted from July 2003 to December 2011. Canada’s contribution of peace-support and combat forces to the International Security Assistance Force (ISAF) in Afghanistan. Canadian Contributions: 40,000 CAF personnel from 2001-2014. Total cost up to 18 billion dollars. NATO Training Mission in Iraq (NTM-I). Conducted from 2004 to 2011. Renewed in 2018: training, mentoring and assisting the Iraqi Security Forces This support operation included training, mentoring and assisting the Iraqi Security Forces. All NATO allies contributed in this in these training efforts. NATO Training Mission in Iraq (NTM-I).Canadian Contributions: 60 CAF personnel in addition to offering up to 30 instructors to train outside Iraq, this total cost was $810,000. In 2018, 250 CAF personnel were posted in Baghdad. Operation SIRIUS: Conducted from October 2004- December 2004, February 2005- March 2005, and November 2005 to December 2005. CAF participation in NATO’s Campaign Against Terrorism in the Mediterranean Sea. Canadian Contributions: 40 surveillance missions and 65 CAF personnel. Operation ALTAIR: Conducted from January 2004 to September 2008. This operation was Canada’s contribution of warships in support of Operation ENDURING FREEDOM in the Persian Gulf and the Arabian Sea. Operation BRONZE: Conducted from March 2004 to March 2010. This operation deployed the Canadian Armed Forces to NATO Headquarters Sarajevo (NHQSa). Canadian Contributions: 1,300 CAF personnel. Operation PLATEAU: Conducted from October 14 to December 2005 in response to an earthquake that hit Pakistan. The African Union Mission in Sudan (AMIS): Conducted from June 2005 to 31 December 2007. This mission aimed at ending violence in the region. NATO provided air transport for some 37,000 AMIS personnel. Canadian Contributions: $255 million in voluntary support and 105 armored vehicles. Operation SEXTANT: Conducted from January 2006 to June 2009. This was Canada’s periodic participation in Standing NATO Maritime Group 1 (SNMG 1), a component of the NATO Response Force. Operation Allied Protector: Conducted from March to June 2009: This operation was an anti-piracy effort conducted in the Gulf of Aden and Indian Ocean. Operation SAIPH: Conducted from October 2009 to May 2012. This operation was Canada’s participation under NATO’s operation OCEAN SHIELD, an operation to enhance maritime security. Task Force Vancouver: Conducted from October 2011 to January 2012. CAF’s participation in NATO’s Operation ACTIVE ENDEAVOUR, an operation to enhance counter-terrorism efforts in the Mediterranean Sea. Canadian Contributions: Deployment of HMCS Vancouver frigate. Operation MOBILE & Operation UNIFIED PROTECTOR: Conducted from February 2011 to October 2011. This was a non-combatant evacuation mission based in Malta, and then became a joint combat mission with air and maritime based in Italy. On 22 March 2011, the conversion of Operation MOBILE to participation in a NATO-led effort began with the launch of Operation UNIFIED PROTECTOR by the North Atlantic Council. Canadian Contributions: 635 personnel, seven jet fighters, two patrol aircraft, two tankers and two frigates. Operation ATTENTION: Conducted from May 2011- March 2014: Operation ATTENTION was Canada’s participation in the NATO Training Mission–Afghanistan (NTM-A), which supported the development the Afghan National Army (ANA), the Afghan Air Force (AAF), and the Afghan National Police (ANP). Moreover, the CAF conducted a number of operations in Afghanistan from October 2001- to March 2014 in difference capacities such as air, land and sea. Canadian Contributions: 950 CAF personnel. Operation OPEN-SPIRIT: Conducted in May 2014. This operation (conducted annually) aims at clearing explosive remnants of war in the Baltic Sea. Canadian Contributions: Annually, 10 to fifteen clearance divers and support personnel from the Royal Canadian Navy. Operation IGNITION: CAF contribution involving airborne surveillance and interception to NATO’s security mission for Iceland. Contributions include up to 160 CAF members, six aircrafts, and a CF-188 Hornet. Operation KOBOLD: CAF contribution to the NATO Kosovo Force to maintain safety and security in Kosovo. There are currently five CAF members. Operation REASSURANCE: CAF support to NATO’s defence and deterrence measures in Central and Eastern Europe. Contributions include 835 CAF members. Operation IMPACT: CAF role in the international coalition to defeat ISIL in Iraq and Syria. Contributions include 850 CAF members. Operation SEA GUARDIAN: Maritime security operation. Contributions include Canadian Ship (HMCS) Charlottetown. Canada continues to champion in its commitments NATO despite some reproach due to “burden sharing”. Canada will contribute 1.23 percent of its GDP on defence this year. Last year it spend 1.36 percent. NATO members are normally supposed to commit a minimum of two per cent of their Gross Domestic Product (GDP) to spending on defence. Currently, only five member countries abide by this – the U.S., U.K, Estonia, Poland, and Greece. Despite not meeting the two percent threshold, Canada has committed to every NATO operation to date. On November 17, at the NATO Parliamentary Assembly in Halifax Defence Minister Harjit Sajjan stated that “budget numbers don’t necessarily reflect a country’s actual contributions to NATO”. Canada’s commitment to NATO is demonstrated through its participation and leadership in a number of roles. Canada’s Defence Investment Plan 2018 includes funded projects outlined in ‘Strong, Secure, and Engaged’. Canada’s defence strategy will have several components to ensure that Canada is more secure and that significant contributions are made to maintain global security. Some of these components include better identifying emerging threats, investing in new technologies, and continuing to support allies and partners abroad. Moreover, Strong, Secure, Engaged aims to make Canada “Strong at home, Secure in in North America, and Engaged in the world”. This new vision will add value to global security and demonstrate Canada’s commitment as a reliable partner and ally and reinforce its role in peace support operations.